NHS England’s Chief of Nursing, Professor Jane Cummings, enjoyed an afternoon tea and a tour of Southmead Hospital to celebrate her retirement after almost 40 years working for the NHS. Jane Cummings chose to return to her ‘roots’ at Southmead Hospital, which is where she trained as a midwife, to visit some staff she trained and worked with at the beginning of her career and also meet other staff members who work for the North Bristol NHS Trust (NBT). She was greeted by Helen Blanchard, Interim Director of Nursing and Quality, to begin the tour of Southmead’s Brunel building stopping in Intensive Care Unit (ICU) and ward 9b, which is close to her heart. 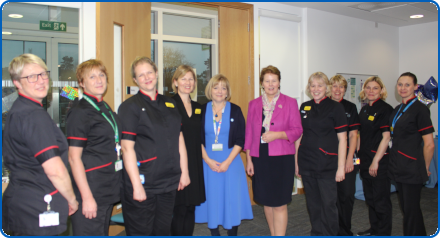 After the tour of the hospital, Jane celebrated her retirement by sharing her own thoughts about the future of nursing and enjoyed an afternoon tea among a select group of nurses. Ward sister, Amanda Gubb, Nurse Consultant Katharine Gale and Sister Lorna said some words and read out a poem written by a member of staff before Jane was presented with a gift. Jane took over England’s Chief of Nursing role in March 2012 and oversaw national programmes, such as the 6Cs, Compassion in Practice, and Adding Value – the national framework for nursing, midwifery and care staff. Earlier this year, Jane announced a major nursing recruitment campaign which was launched in the summer to celebrate the NHS 70th birthday.